There are currently an estimated 100,000 homeless cats in the GTA. And an estimated 400 kittens are born in our city streets every day of the spring and summer. GTA shelters are overpopulated, and healthy cats and kittens are being killed. This evening, the Toronto Feral Cat Coalition screened Justine Pimlott’s documentary, Cat City, at the Revue Theatre. The coalition is a group of rescue organizations working together to reduce Toronto’s feral cat populations through targeted Trap-Neuter-Return (TNR) programs. The coalition includes: Toronto Animal Services (TAS), Toronto Feral Cat Project, Toronto Cat Rescue, Annex Cat Rescue, Toronto Humane Society (THS), Action Volunteers for Animals, and Animal Alliance. The screening was followed by a panel discussion with Dr. Esther Attard (TAS spay/neuter clinic), Ferne Sinkins (past President of Toronto Cat Rescue and member of the THS board), Deborah Chalmers (a founder of the Toronto Feral Cat Project and a colony caretaker in Parkdale) and Heather Brown (TNR expert and volunteer for Annex Cat Rescue and Toronto Cat Rescue), moderated by Dr. Hanna Booth (THS board member). The screening focussed on the work of the cat rescue agencies, as well as Second Chance sanctuary and Bill Bruce, head of Calgary Animal Services. TNR is the only humane and effective method for controlling feral cat overpopulation. A TNR program ensures that all the feral cats in a colony are trapped, neutered and returned to their territory where caretakers provide regular food and shelter. Tame adults and young kittens who can still be socialized are placed in foster or adoptive homes. This week, TAS announced the opening of the city’s first no-cost spay/neuter clinic for ferals and strays. During the panel discussion, Deborah Chalmers informed us that the Toronto Feral Cat Project’s aim is to collect data on colonies to provide backup for negotiations with city governments and to inform donors. TFCP has an online colony registration system on their website; certain information is kept confidential to protect colonies and their caretakers. TFCP also runs workshops on TNR. 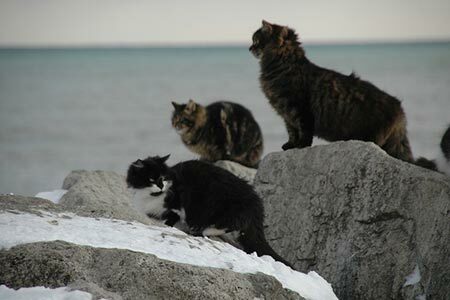 Heather Brown, who volunteers for THS and two cat rescues works with the Regent Park colony comprising about 150 cats. Since May, 60 cats have been trapped, and half of them have found homes. The need to trap this colony is urgent because of the construction that is taking place. Cats are living in abandoned buildings that are being bulldozed. To the question of obtaining lower-cost spay/neuter services, Dr. Attard mentioned that, although veterinarians have high overhead costs, she felt that spay/neuter services should be priced as low as possible. Many vets actually provide pro bono or low cost service for rescue groups. She urged the audience to approach the OVMA and the College of Veterinarians to ask why services couldn’t be offered to the general public at cost. Ferne added that it’s important to shop around, as spay/neuter costs can vary between about $130 and $700 in the city. There are low-cost spay/neuter clinics in Newmarket and Barrie; the fee is $50 and there are waiting lists. THS would like to set up a high-volume spay/neuter clinic. Mention was also made of Dean Maher (who is running for councillor in Trinity-Spadina ward) and his efforts to shut down cat and dog sales in pet stores, which are generally sourced from kitten and puppy mills. There was high interest in Calgary Animal Services’ best practices and what we could learn from them. Bill Bruce has partnered with the municipality and rescues to build a no-kill community. Calgary’s euthanasia rate is about 5% and it is a last resort. Dr. Attard pointed out that their funding comes from pet licensing which is highly successful. It’s important to communicate that the licensing funds go towards the animals, and that it is not simply a tax that can be used elsewhere. Dr. Attard also mentioned that, if people are having difficulty getting action through their city councillors, TAS may be able to help influence the city on their behalf. To the question about surrendering a tame colony cat to THS, it was felt that feral cats are “owned” by the colony caretaker, so this is a possibility for rehoming. The original screening of Cat City was on Global TV. A DVD is available from Red Queen Productions for about $20, of which half of the proceeds go to TNR initiatives. October is Feral Cat Awareness Month. Volunteer to trap, transport, recover or foster cats. Donate to TNR programs or the TAS spay/neuter clinic. Join the THS TNR committee. Build shelters. Become a colony caretaker. Spread the word. This entry was posted in Animals, film and tagged Action Volunteers for Animals, Animal Alliance, Annex Cat Rescue, Cat City, feral cat, Justine Pimlott, Toronto Animal Services, Toronto Cat Rescue, Toronto Feral Cat Coalition, Toronto Humane Society. Bookmark the permalink.